The above image is a photograph of The Doors, a telematic performance in which video and sound images from two different locations, Bucks New University and Royal Central School of Speech and Drama, are brought together in a single image. The Doors was presented as part of a day-long research symposium, The Spaces of Telematic Theatre, held on 19th September 2014, led by Julian Maynard-Smith of Station House Opera and Dr Jem Kelly, Senior Lecturer in Performing Arts at Bucks. Students from the BA Performing Arts performed throughout the day, their images telecast from High Wycombe to London, then superimposed onto various video projection surfaces at Central. 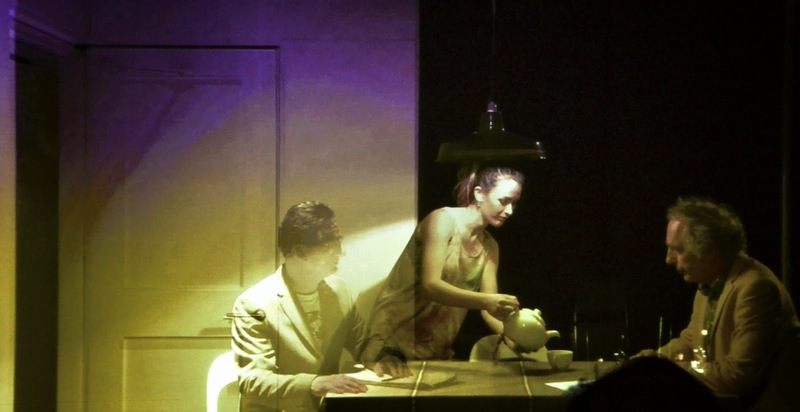 This performance represents part of an ongoing research project into the application of new technologies to theatre, led by Jem in collaboration with Julian and Station House Opera. An here is another one; this one is produced by Charlotte, Rachel, Rita, Ryan and Rob and inspired by Terri Gilliam . . .
hence a little more cheerful than our previous offering . . . In the first year on the BA (Hons) course in Performing Arts (Film, TV and Stage), students are introduced to technical skills in camera handling, film production and editing. They explore their own creativity in a short film exploring a director or cinematographer of their choice. Here is a video produced by Lucca, Matt, Rayanne and Sebastian who explore the methods and cinematographic style of the Coen Brothers. UCAS Deadline is fast approaching! Do you want to apply for university? Get your application ready! Applications for the majority of courses should arrive at UCAS by 18:00 (UK time) on the 15 January 2015 (check course details for the correct deadline). This is to ensure that it gets equal consideration by the unis and colleges you're applying to. The reference has to be completed before your application can be submitted. For info on the Performing Arts BA (Film, TV & Stage) at Bucks University, select the ‘Apply’ tab from the main menu.